Hey all you fashionistas, we know that it's been a tough tradeoff for you between having the wardrobe of your dreams versus having enough inventory space to play the game. So a new feature of Lost City of Omu is the Fashion Bag. 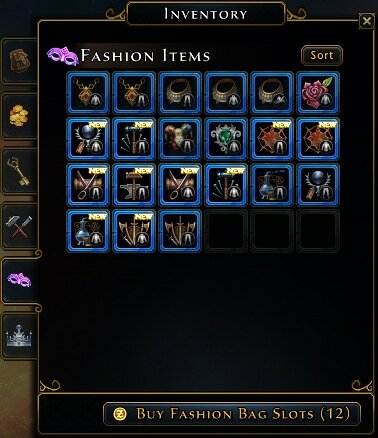 Your Fashion Bag is a new tab on your inventory window, which takes the position of your "Idle Companions" tab (more on this later, but you’re not losing your Idle Companions! They are just moving!) Only fashion items can go into this new bag. So you can move fashion items from your inventory to this new bag, to make room for other things that have to be in your inventory. Just drag and drop a fashion item in your inventory onto the tab with the purple mask. You start with 24 fashion slots in the new bag, and you can expand it, 12 slots at a time, for 250 Zen. Fashion items can also still go into your bank, as normal, or they can stay in your regular inventory. Whatever works for you! We won’t be moving any of your fashion items automatically. It’s up to you to make use of all this new closet space. 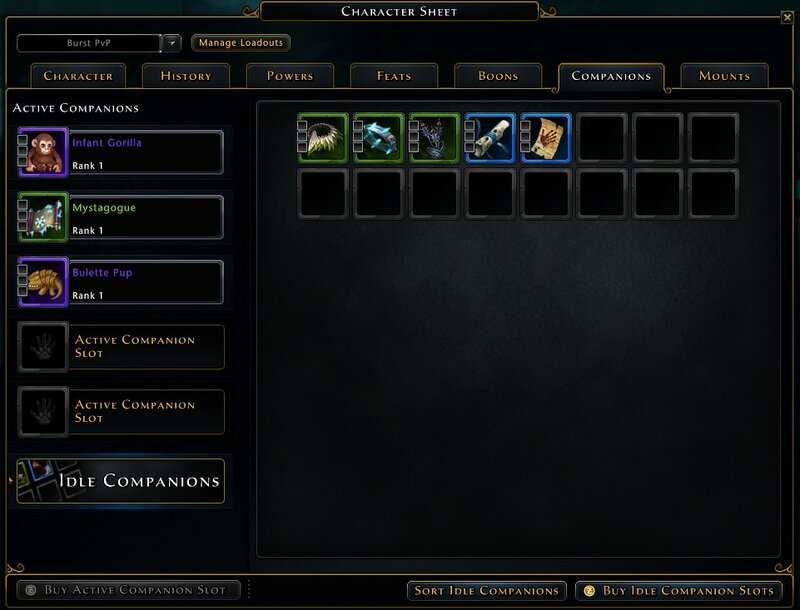 Equipping fashion items remains the same; drag and drop or right-click the fashion item, or use the buttons beside each fashion slot in your Character Sheet for a filtered list of available items. What has happened to my Idle Companions, you may ask? They are all still present, along with any extra slots you bought. On PC your Idle Companions are now shown embedded in the Companions Window when you select the “Idle Companions” tab from the left list (this is pretty much how Xbox and PS4 has always worked). The options menu for an idle companion should work as before, or drag and drop them onto an active companion slot to make them active. We hope you enjoy all this new wardrobe space. Go forth and be fabulous!